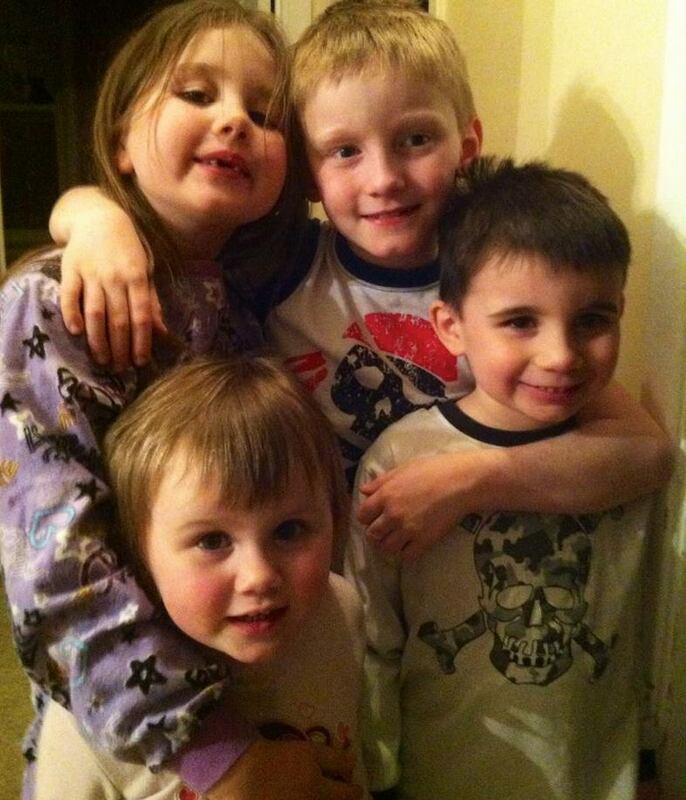 My son now 7.5 (top right) was completely vaccinated and suffers extremely with Tourette's, a neurological disorder. My daughter now 6 (top left), at the age of two months was hospitalized 10 hours after her shots, and was in there for almost a month. Fever of 104.9 for three weeks. She was on Oxygen and life support. We are very lucky she didn't die or suffer any brain damage from the high temps and multiple seizures she suffered daily for two weeks. She was not vaccinated past that one round. The bottom two are vaccine free (she is 2 and he is 4) and we are so proud of our decision! All attend regular school and regular daycare, with a vaccine exemption form, of course! Sadly we watch our oldest suffer daily! With Tourette's you suffer from multiple symptoms including sensory processing disorder, motor and vocal tics, OCD, ADHD at times and anxiety. We have started detox! No meds! All natural to calm tics and symptoms and it works wonderful! We even shocked the doctors! Teachers! Principles! Always fight for what you feel is right! Unvaccinated children are healthier. It is easy to observe and the media needs to listen to what these parents are telling us. Felt the need to share this conversation to shine some light on the health of unvaccinated children, for those concerned about not vaccinating. This conversation took place on a recent post. One mother commented: I'm preggo with my 3rd child. My first 2, I was blindly and naively led by Doctors. Now that the blinders are off, I will not be vaccinating. I'm anxious to see what health complications she won't have. Another mother replied: I have 5 children and vaccinated the first two fully. They were always sick. Ear infections, throat infections, horrible croup, always having breathing treatments. Croup so serious that my insurance covered a breathing machine to keep at home. For my third child, I decided to wait until she was 2 before vaccinating. She was never sick. No croup, no infections, slept so well. It was then that I decided to start researching. Needless to say, I never vaccinated her, or my last two. The last three are my healthiest kids. I wish I would have made the connection every time my first two got sick. I was in the Drs office every two or three months with the first two. Hindsight is truly 20/20. And another mother replied: I too have 5 children! My first 2 vaccinated with a list of childhood illnesses. RSV, which induced asthma symptoms, ear infections, high fevers (my son: 104). My second born was diagnosed with autism and this made me rethink everything and anything. To protect my 3 others, I have not vaccinated and I'm not going to lie, they have never seen a prescription drug at ALL. They get the common cold but it is very short lived and gone! My oldest always get the full blown fevers, antibiotics. Coincidence? I'm glad I made the choice I did. If you wait until your child is born to think about vaccines, a vaccine injury is almost impossible to recognize. You are too tired and overwhelmed when it strikes. You are too immersed in the trees to see the forest. Too busy putting band-aids on symptoms to see the syndrome. You might be told that you have a sensitive, high-needs baby on your hands and his sensitivities manifest as colic, reflux, head-banging, food allergies, or contact rashes. You will be told that it is all normal, which is the truth, considering what passes for normal these days. Now I see these signs in other infants and I try to intervene. I try to warn the parents that these sensitivities mean so much more than their doctor tells them. I know that these parents are too down in it to see for themselves. My son was born and like a lot of people, we put more thought into the paint in his bedroom than we had into vaccinations. I knew one person, nearly a decade ago, who didn't vaccinate his children. He said, "We don't put that crap into our kids." He scared me. I thought he was a conspiracy theorist. I would never be like that guy. We were presented with the Hepatitis B vaccine paperwork on our child's third day of life, just before leaving the hospital. I have a Bachelor of Science in Biology but I didn't know what Hep B was. None of the parenting books I'd read mentioned that I would be expected to make a decision I knew nothing about while I was high on painkillers. If you don't already know, Hep B is a sexually transmitted blood borne disease that is also spread through using dirty needles. Children don't catch Hep B at the playground, or from a sneeze, or from drinking water. The vaccine administered to a newborn baby will have long worn off by the time the child becomes sexually active. If a mother is Hep B positive and has been receiving prenatal care, she certainly knows her status prior to the baby arriving. So why are hospitals vaccinating all of our newborns for Hepatitis B? Because they can. Because almost no one says "No." It is as simple as that. We all want to trust our doctors. No one wants to believe that the CDC and the AAP aren't looking out for our best interests. No one wants to retroactively realize they were responsible for harming their babies. No one wants to debate their child's pediatrician. No one wants to have this battle with their spouse. We allowed the Hep B vaccine that day. We actually said, "It must be a really big deal or it wouldn't come with all of this consent paperwork," but allowed it anyway. We took our baby home that evening and spent the wee morning hours wishing we could put that hysterical child back into my body. We didn't make a connection between the two events. We were already too down in it to see. A week later we were still miserable. My husband would race home from work to help me. I would still be in my pajamas, covered in spit-up, leaking milk. Our baby would be crying. I would be crying. I wouldn't have fed myself, brushed my teeth or folded any laundry. At two weeks old our son was diagnosed with "classic colic" and it did not let up for the next five months. It was the most severe case of colic anyone in our lives had ever seen. We ended up medicating him with an antispasmodic to save our marriage. When he was nine weeks old I took my fussy baby in for his 2-month checkup and was attacked with paperwork. I wasn't prepared for what the check-up would entail. "Sign here, sign here, sign here, he needs his vaccinations." They were three injections and two orals that covered 7 diseases. "Is this safe? Why are there so many?" They don't want you to ask questions. They don't have any answers. There is a list of side-effects on the package inserts but they do not share it with you. You are rushed to hurry up. I asked to nurse him through the shots and was denied. I signed off on the vaccines. Within 20 minutes he fell into a deep unwakeable sleep. This colicky child of ours did not usually fall asleep out in the middle of commotion. He did not ordinarily pass out the moment I put him into the car. I called my husband to tell him that something was wrong. I put our son into his crib but even the transition did not wake him. I hovered over him as he slept for hours; something he'd never done before. When he finally did wake, he screamed a high pitched scream I'd never heard before or since. I remember running into his room and standing over him with the phone, letting the nurse at the doctor's office listen. She insisted this hysteria was due to "pain from the injection site" and said I should give him more Tylenol. I didn't believe her. The note they sent me home with said to call if he had a high-pitched scream so why were they saying it was normal? He didn't want to be held. He didn't want me touching him. After 15 minutes of ear-splitting screams I nursed him back to sleep. I was sitting inches from him in his baby hammock chair when he woke the second time. I will never forget the way his arms stiffened up and shot out from his body with his piercing screams. His eyes scrunched tightly shut as he put every ounce of his energy into the terrifying sounds coming out of his teeny, tiny person. He wasn't looking at me. He didn't even know I was there. He went back to sleep and the scream stopped. His scream was cry-encephalitis, also known as the DTaP scream. It is brain inflammation. It is literally an allergic reaction to vaccines in the brain. It is not uncommon. Had I taken him to the ER, it would have been documented with an EEG. Instead I was lied to by my pediatrician's office until the event had passed. Children do not have the requisite myelin sheath coating their nervous system pathways to withstand bombardment of viruses, aluminum, mercury, formaldehyde, MSG, and animal DNA. Damage to the nerves not covered by myelin sheath is autism. It is Asperger's. It is epilepsy. It is asthma. It is well-documented and accepted by mainstream media that damage to the myelin sheath is physically and mentally debilitating in head injuries, yet the connection to autism remains unacknowledged. Believe me, it made me sick to think about not vaccinating my child. I flip-flopped on my stance countless times. I told myself that at his next vaccinations we would go wait in the parking lot of the emergency room just in case. Then I told myself that was crazy talk; what kind of mother would subject her child to something that might send him to the emergency room? The day before his 4-month doctor appointment I finally got up the nerve to tell his doctor we were holding off on more vaccinations until he turned one. The doctor took the news so well that I felt silly for making myself sick over it. My 6 month old breastfed baby had a deadly peanut allergy. I didn't see a connection. I was way too down in it by now. At 12 months old his pediatrician who promised us that he "wasn't a stickler" for the CDC vaccination schedule kicked us out of the practice for not resuming the shots. "It's stressing me out not to vaccinate your child," he said. I was holding my baby in my arms, trying to explain our fears, describing how horrible that terrifying day ten months prior had been. I told him how worried I was that we would end up in the ER this time. I was humiliated. He'd told his entire staff he was kicking us out that day. I left in tears. I thought of all of the things I'd wished I said to him for months to come. At 13 months old our child broke out in hives at a birthday party from bites of a meatball that contained walnut. At 16 months we'd had enough and took him to an allergist for a $600 skin test. He was officially diagnosed with allergies to wheat, egg, melon, cat, ragweed, grass, cedar, tree nuts, and a deadly peanut allergy. We've since learned that he can't have corn or potato and still can't eat banana. My baby has a dozen allergies. My child was 16 months old when he was diagnosed with the slew of allergies and I didn't make the connection that he was harmed by the vaccines even then. I was mystified. I asked the allergist what caused these problems in my child. His answer was, "He's under-vaccinated. We need vaccines to challenge our immune systems in order to eat food without our bodies attacking it." Although I did not believe such an unfounded statement, I was too busy putting band-aids on symptoms to see the syndrome. It wasn't until The Greater Good was released in October of 2011; nearly 2 years after the fateful vaccinations that the anvil hit me on the head. It all made sense. The colic, the encephalitic scream, the rashes, the mast cell issues, the hyper-vigilant immune system. How do they publicly proclaim, "We vaccinated on schedule and my child turned out just fine!" but in private they are dealing with these problems? Welcome to the new normal. Your child isn't fine. Your child is vaccine-injured just like mine.